Hello! Today is my birthday, and to celebrate, I'm giving a gift to you! 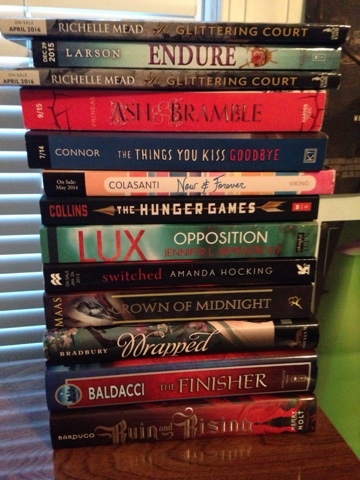 If you win, you can pick any book from this stack! If there's enough entries, I might do some second place swag giveaways! Happy Birthday! I hope you have/had a marvelous day. I'm sure you deserve it. I don't really have any birthday traditions. I always have to make my own cake. :( Hopefully I can get some new traditions going around here. Thank you so much for giving US a gift even though it should be the other way around.